A scammer recently victimized several people by stealing the “self-show” lock codes on at least two vacant rental properties, advertising them on Craigslist for far below market rent, and then enticing the eager rental applicants into wiring him money. Now, the property management company is busy reviewing security procedures and working on restoring its reputation. While this was a brazen scam, it points to a common problem: how to protect vacant properties. 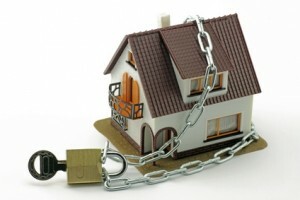 Before securing the property, determine whether you have the right to enter. If the previous tenant abandoned the rental prior to the expiration of the lease, seek legal advice before entering. Once the property is legally vacant and contractors have finished their work, walk through and check for unlocked doors and windows. Change the locks or passwords immediately. Former tenants, friends or relatives, and even contractors have been known to return to a vacant property using a propped-up window, key, or password. Check for dangers like a dripping faucet or other hazards left behind by the former tenant or contractors working on the property. Check the smoke detectors. Fire in a vacant property may spread until significant damage occurs, so its important for neighbors to hear the alarm. When taking pictures of the restored property for the rental ad, consider the risk of highlighting new appliances. Also, avoid the term “available immediately” in online ads or on the for-sale sign. Find out the extent of your insurance coverage and whether that changes if the property is vacant. Do you need a special rider to cover vandalism? Is theft covered? Your agent can fill you in on any requirements, restrictions or limitations, and may provide additional tips for securing the property. Adjacent property owners are probably watching what’s happening at the property anyway, so take advantage of the extra set of eyes and ears. Chat with a neighbor about the status of the rental and ask them to call if anything seems off. One of the best ways to stage a vacant property is to ask a cooperative neighbor to park in front of the house or in the driveway. Little details, like footsteps in the snow leading to the mailbox or the bin sitting out to the curb on trash day can throw off a would-be thief. Staging with furniture is a highly-effective strategy, but that can be costly. A cheaper alternative is to stage empty moving boxes in the garage or living room to confuse a prowler peering into a window. It’s best to keep the blinds closed and to place light timers on random. Keep the lawn trim and the automatic sprinklers running. When checking up on the property, don’t simply drive by. Check the inside and the backyard. Keep the car in the driveway and stay around for as long as possible to create a lived-in look for someone who might be casing the property. Don’t leave the garage door open if it’s empty, and don’t open the blinds and reveal empty rooms. If the property does not have an alarm system, it’s still possible to create some of the same defenses. One of the cheapest and most effective crime deterrents is a “Beware of Dog” sign. Consider a “Smile, You’re on Camera” sign placed beside a fake camera. It may be possible to purchase a temporary alarm service package with warning signs for the yard, doors, and windows. Fake signs also are available. Motion-sensitive lighting and a dog-barking machine are other clever devices that can deter crime. Of course, there is always the option of installing a permanent security system that allows remote viewing of the property. The more strategies a landlord can implement, the greater the chance of avoiding scams, crimes, and property damage.